A diamond is rightly considered the king of precious stones. In order to properly assess the size of this Royal stone, it is necessary to relate its weight with the proportions and nature of the cut. There are several ways to determine the weight of the diamondand. The most accurate result can be obtained with the help of special carat weights. One carat is equal to 0.2 grams. The scale division of a carat consists of one hundred units, respectively, the gemstone is weighed to the nearest hundredth. The diamonds, which weigh 0.01 carats, is considered a baby. 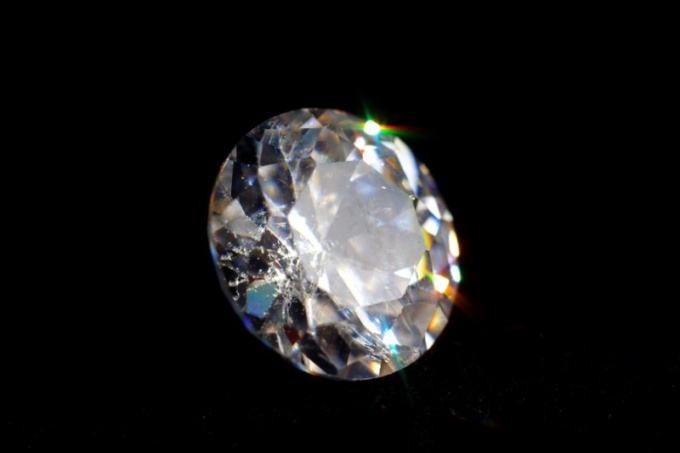 Depending on the resulting mass of stones are divided into small (less than of 0.29 carats), medium (at least of 0.99 carats) and large (over 1 carat). Diamonds with weight more than 6 carats, are sold, usually through a special procedure – auction. In cases where the stone cannot weigh, for example, it is installed in a piece of jewelry, its weight is calculated using a special formula – M=(D2) x H x 0,0061. M – mass of the desired carat, D – diameter of the stone, H – its height. This formula is used in the calculation of standard weight of diamonds round cut and has a margin of error within 10 %. If you measured the precious stone has distorted and asymmetric cut edges of the inaccuracy of the formula increases substantially. Another option for determining the mass of a diamond with diameter is a special calculation table. To do this, measure the diameter of the diamond and correlate it with the data table. So the stone having a diameter of 2 mm. will weigh approximately 0.03 carats. When the mass of a diamond is known, it is necessary to pay attention to other essential characteristics, determining the value of the stone. These include the proportions and quality of the cut. Because diamonds are processed manually, the stones may be of the same weight, but different sizeohms. Depending on the nature of the cut of the diamond can weigh more than the weight at which he looks. Purchasing a copy will be unprofitable, as the cost depends on the weight of the stone, not its size. In order not to pay extra, measure the full height of the diamond with the help of Vernier caliper. Then, calculate the ratio of this figure to the diameter of the stone in percent. For the diamond standard round cut height should not exceed the figure at 62 – 62.5% of the longest diameter. Another subtlety in determining the sizeand value of a precious stone are the so-called transitional mass. For example, a diamond weighing 1 carat (with a diameter of 6.5 mm. faces) is visually identical to stone 0.95 carats (with a diameter of 6, 3 mm. ), and their price will differ by more than half.